Vitrail Light is a special effect custom coating and variations will occur. 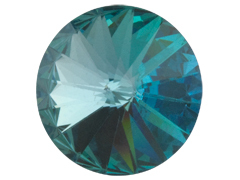 The base Aquamarine rivoli is manufactured by Swarovski and the Vitrail Light finish is an after market coating not applied by Swarovski. Just LOVE all your rivolis and findings!! ..